We enjoyed Mesa Verde National Park so much during our first trip there in late winter/early spring. However, we missed one thing — a Ranger-led tour of the sites. Tours are not available during the winter months. We anxiously anticipated a return trip complete with tours of the sites. 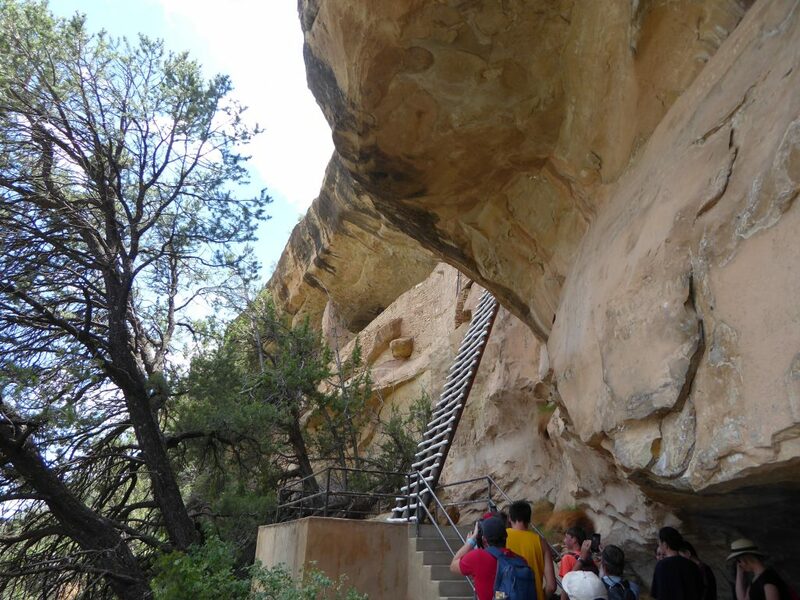 Our second trip to Mesa Verde included Ranger-led tours of Cliff Palace and Balcony House. 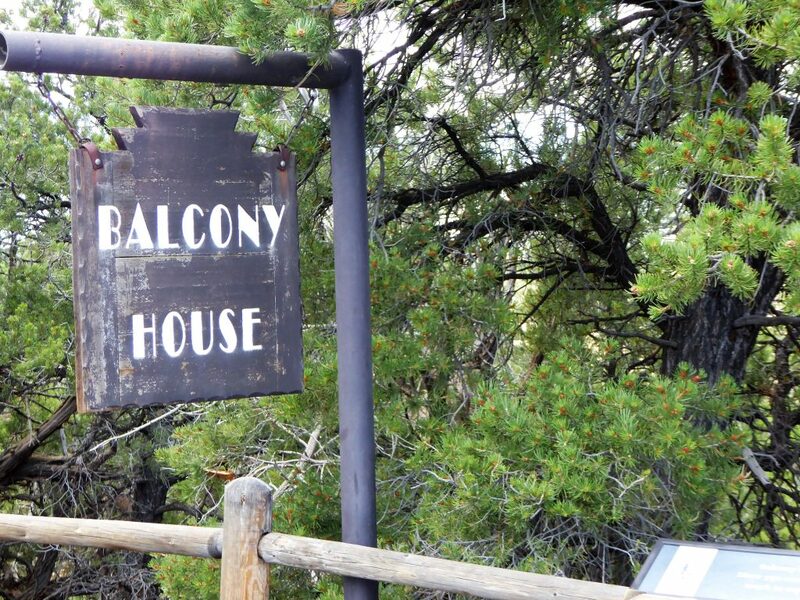 The Balcony House Tour is the more arduous tour, requiring a quarter-mile hike down to the site, a climb up a 32-foot tall ladder, a crawl through a narrow tunnel, and a 70-foot almost vertical ascent up a rocky cliff using foot-and-hand holds, narrow sandstone steps, and steep-pitched ladders. Mesa Verde National Park, in the southwest corner of Colorado, is a UNESCO World Heritage site and one of the U.S. National Park Services oldest sites. 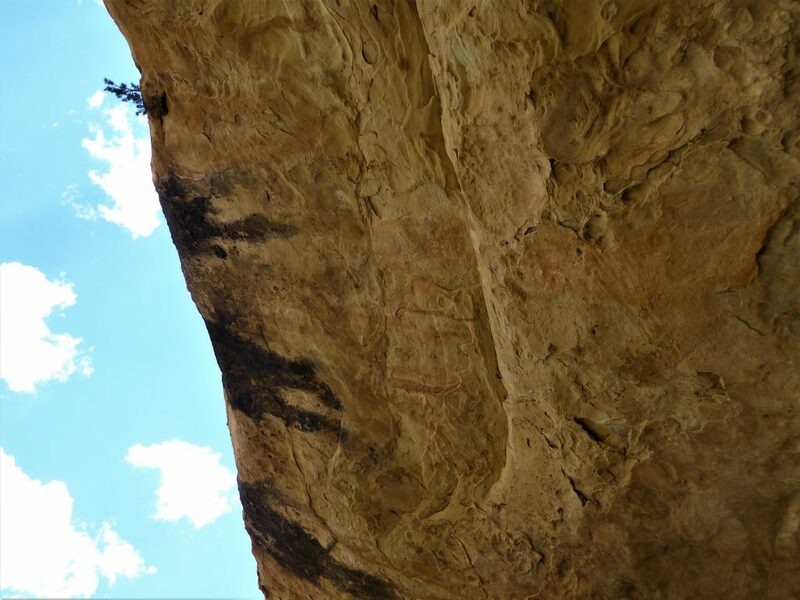 The 55,000 acre park was the first national park designated specifically to preserve the cultural heritage of a people (in this case the Ancestral Puebloan people who lived in the Mesa Verde from 600-1300 A.D.). The park is famous for some 5000 archaeological sites, from pit houses to the famed cliff dwellings. What makes Mesa Verde so fascinating is the mystery surrounding the departure of the Ancestral Pueblo people around 1300 A.D. Many theories abound regarding their sudden departure from the valley. People conjecture that famine, fire, drought, or enemies brought about the transition of the people from Mesa Verde south to present day New Mexico and Arizona. Modern-Day ancestors claim that it was time to leave the region. Tours of Cliff Palace, Balcony House and Long House run every half hour during the summer months. Tours last one hour. The answer may remain a mystery. But the allure of Mesa Verde is palpable today. Hundreds of thousands of visitors journey to the park yearly. Balcony House is one of the many cliff dwellings at Mesa Verde built in the 1200s A.D. It also is one of three sites you can take a Ranger-led tour. Balcony House is medium-size cliff dwelling with 40 rooms. 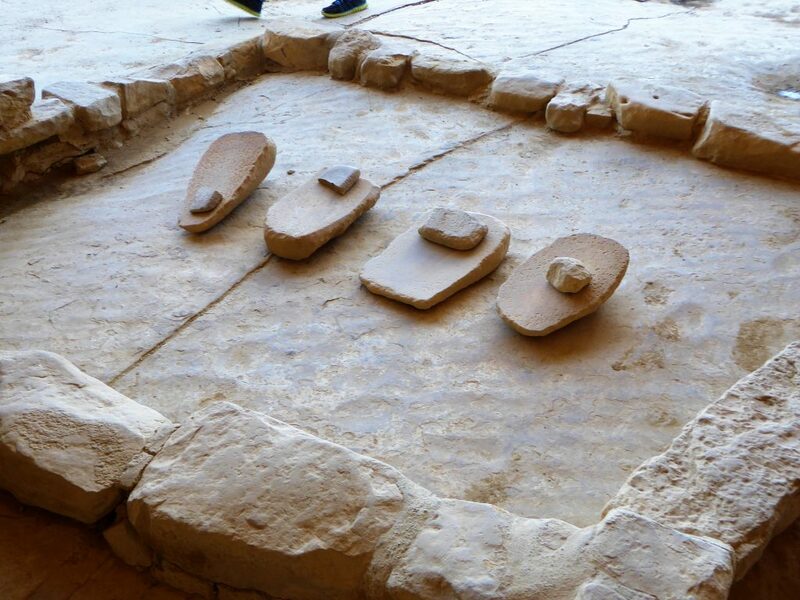 The structure has two preserved kivas (places of worship), leading experts to believe that two families resided in the structures. 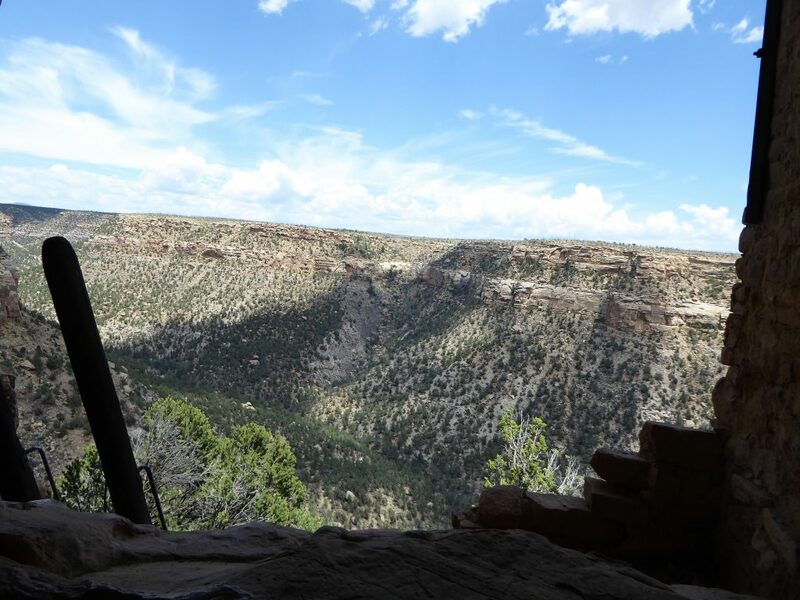 One of the special features of Balcony House is its inaccessibility from the roads on the upper mesa. The structure can be seen from a lookout far away, but the site is unseen from the parking lot above it. You absolutely must take the tour and hike the 100 feet down (and up) to see the location close up. Tour costs are $5 USD per person and can be booked two days in advance at the Visitors Center or Museum. Unlike the Cliff Palace tour, Balcony House allows you almost unfettered access to climb in and look around the rooms and the structures. The tour, however, is not for the faint of heart. It is grueling. It’s best to take it in stages. As you begin the tour, your Park Ranger will walk you through the stages of the tour, explaining that you will ascend a 32-foot tall ladder and crawl through a 12-foot crevice. However, words don’t adequately describe what it feels like to make those vertical climbs. Once you’re in the thick of it, however, there’s really no way to turn back. 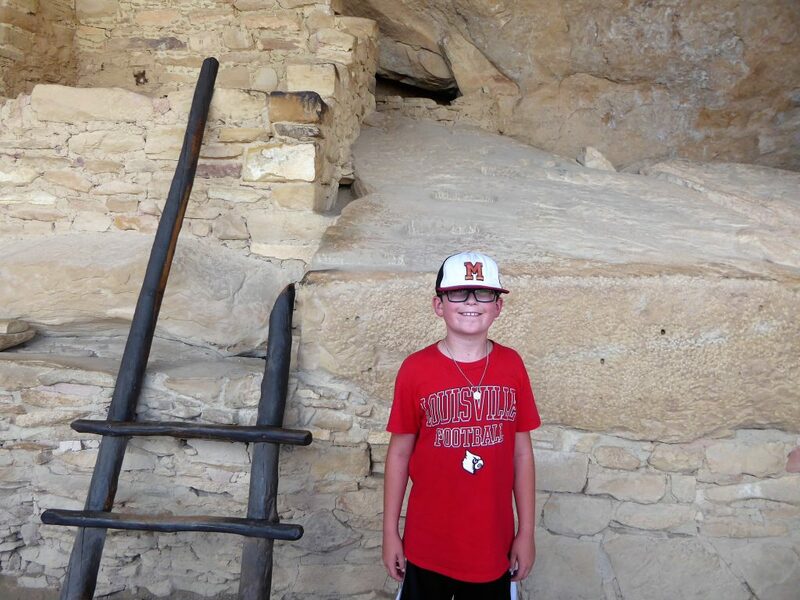 Our son is afraid of heights, but he has a great affinity for the Ancestral Pueblo people. He says that he can sense them talking to him at Mesa Verde. So, he was willing to confront his fear of heights to take the Balcony House Tour. The tour begins with a short walk past a roped area and down a paved walkway. You learn what we know about the Ancestral Pueblo people and also learn that there is a lot we do not know. The people were farmers, growing beans, squash and corn. The area also had deer and elk for them to hunt, but as the years wore on the forest land was wiped out and the large game left. While the Pueblo lived in the region for 700 years, they only built cliff dwellings the last 100-150 years at the site. After the talk, we were led further down the paved walkway, past a gate and to the base of a ladder. The descent from the parking lot is about 100 feet. At the base of the ladder, we were able to look up into Balcony House. From here we saw evidence of a seep spring. 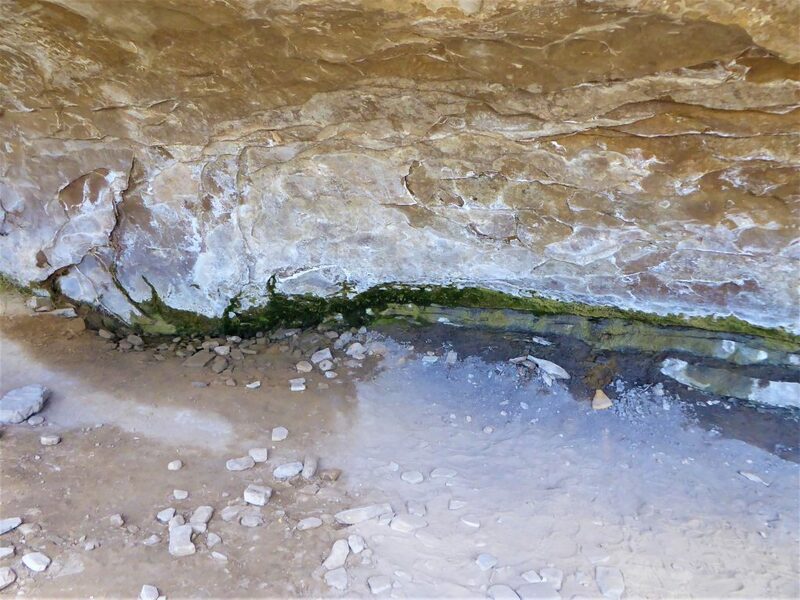 The seep springs were water sources for the Ancestral Pueblo. Rain water seeped into the mesa above, working its way through the sandstone. 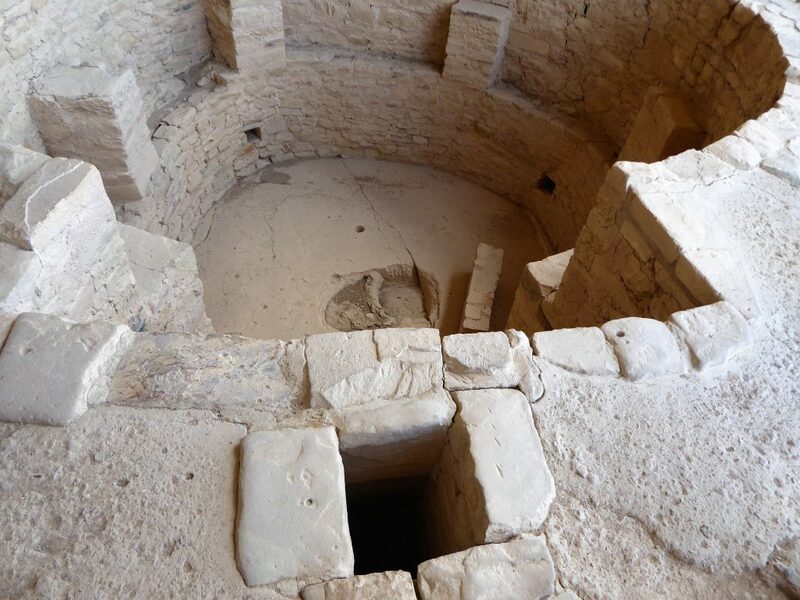 While our seep spring drained into the dirt, the Pueblo would have collected the water building stone chambers. Once up the ladder, we walked through a narrow, dark passageway on to the balcony of Balcony House. Here we looked into the rooms and admired the craftsmanship of the houses. 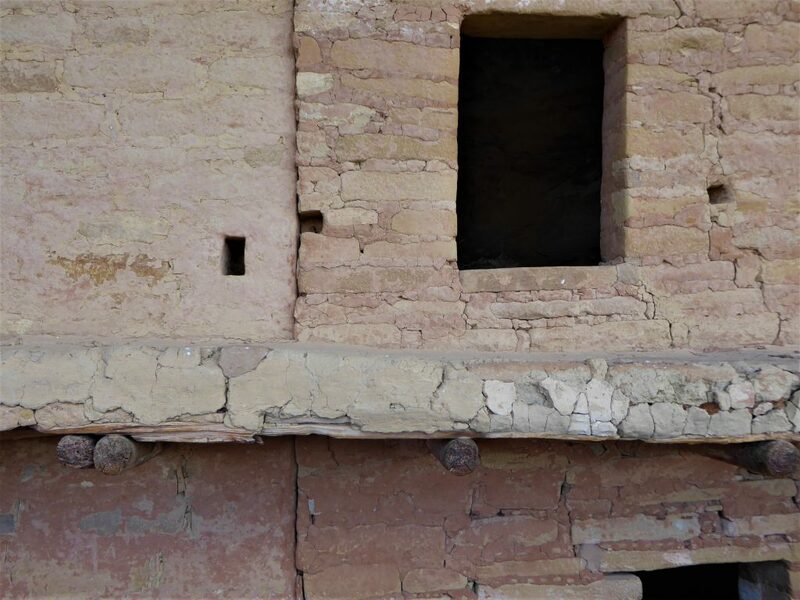 The rooms were built with bricks and mortar and covered with a adobe or mortar. Most likely, the covering was a bright red, suggesting that the cliff dwellings were not hidden from enemy view. We were able to see some of the mortar still intact. 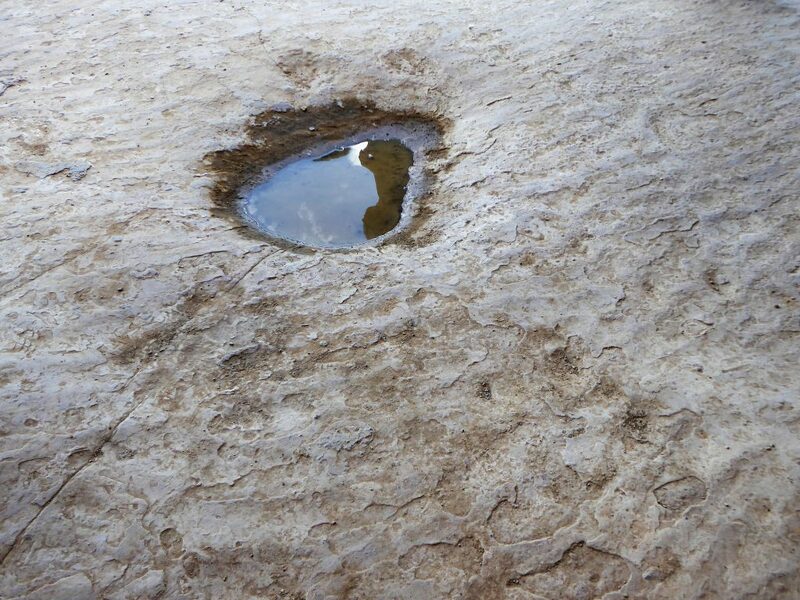 In this arid region, there was very little decay and weathering. Also, since the home was on the opposite side of prevailing winds it faced very little exposure to elements like wind, rain, snow and ice. Hidden under the sandstone cliffs, the rooms are fairly cool in summer and conserve heat in the winter. At Balcony House, we saw that the structures were always repaired and rebuilt. We saw evidence of a door closed off and sealed with mortar. We also saw the sandstone above stained black with the soot of fire from ancient fireplaces and stoves. From the dwelling, we looked out to the mesa top above us and into the deep earthen walls leading to the valley below. The valley is hundreds of feet below. 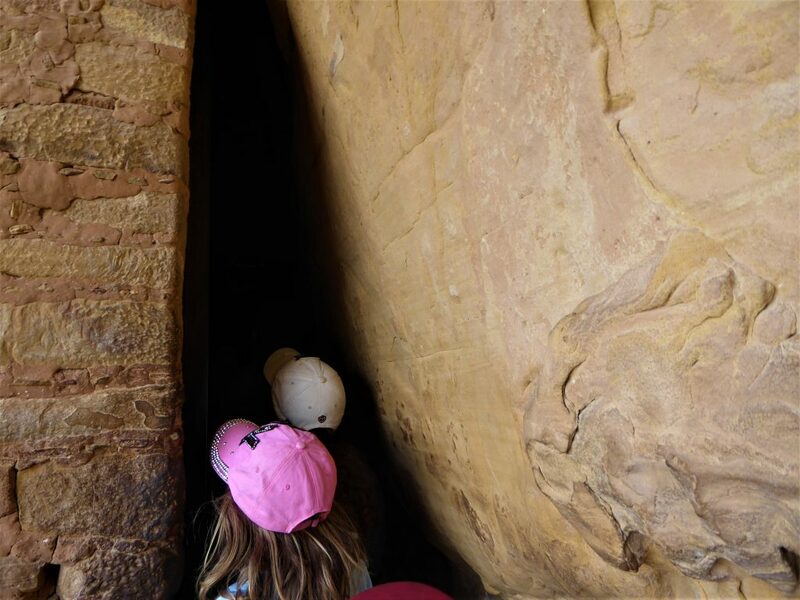 Scholars believe that the Ancestral Pueblo would have climbed the sandstone up to the mesa to farm and then climb back down to their homes using foot and hand holds carved into the rock. They also may have used ladders for the climb. From here we walked into the cavern, through some rooms to the other side of Balcony House where we saw the two kivas. The kiva is a circular place of worship. It was an in-home chapel where the family would worship. 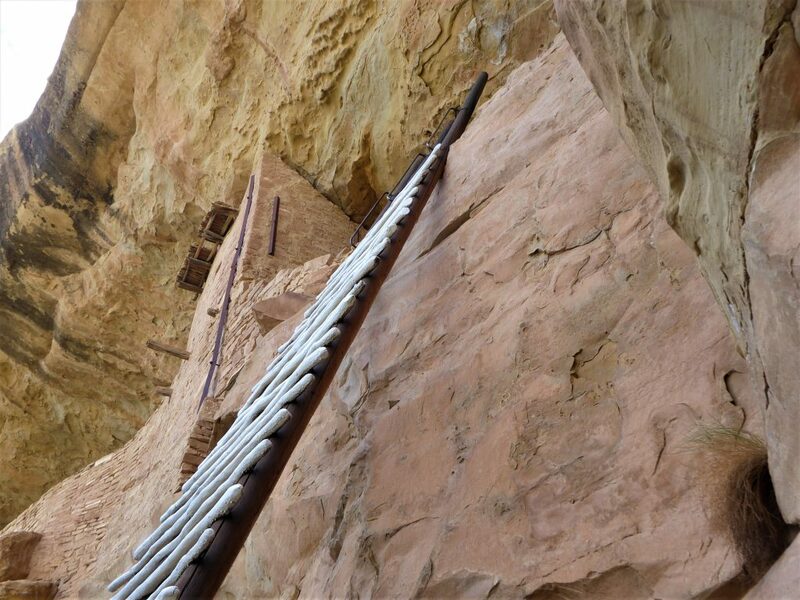 Today, the kivas are open, but in the day they were roofed and one entered from the roof by climbing down a ladder. 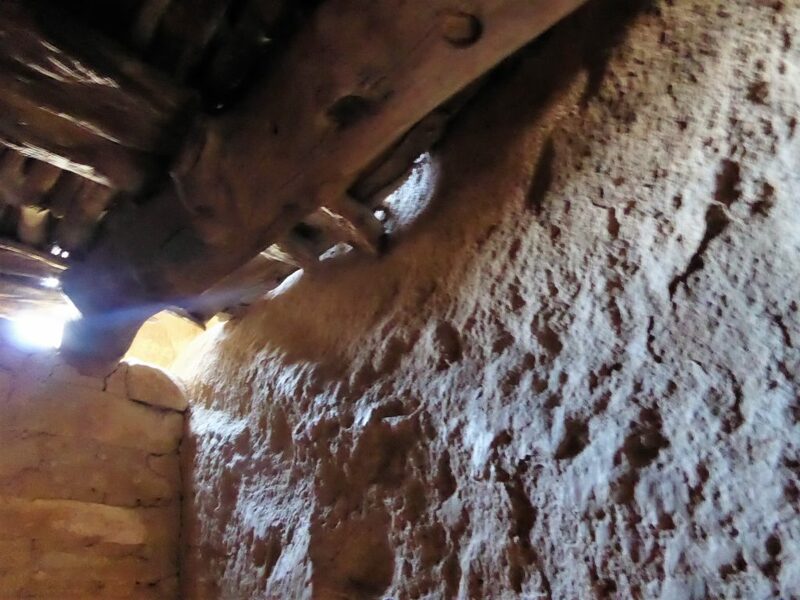 Kivas have an elaborate ventilation system with air pulled in from outside, deflected throughout the structure and then released through a chimney. Much is still unknown about the religious practices of the people, but we do know from the kivas that religion played an important role in the culture. At this point, the tour ended officially. We were able to wander around the structure, looking in rooms where we were able to see some artwork on the walls. Mano and metate, or mortar and pestle, are at the site, too. We found a small pool of water left over from the previous night’s storm. The Pueblo would have used crevices and holes like this to collect water. We loitered as long as we felt comfortable, and then left Balcony House. Our exit was located where the residents most likely entered the structure. We got on our hands and knees to work our way through a narrow 12-foot long crawl space. Midway through the tunnel you can stand up and from here I was able to see wood beams thought to be original to the design of Balcony House. This crawl space was likely how the residents entered Balcony House. We descended 100 feet from the parking lot. We climbed a 32 foot ladder to get into Balcony House. That meant we had a 70 foot climb back to the parking lot. This was a steep climb. There are a series of ladders that are almost completely vertical. Sandstone steps are carved into the rock. These too are steep, and we had to hold onto anchored chain next to the steps. Some of the ascent simply requires you to rest your hand or foot in holds carved into the sandstone. We didn’t take a lot of time to think about how crazy and slightly dangerous our ascent was. It was better for us to press on and not look back (or down, please don’t look down). While the climb up the 32-foot ladder did not seem too bad, this climb out of Balcony House was a little extreme. Those with difficulty climbing stairs would have difficulty on this tour. As we reached the top of the climb we noticed a turkey vulture flying above the mesa. The predator in search of carrion was a reminder of the every day dangers the Ancestral Pueblo faced. It also reminded us how we had successfully toured Balcony House overcoming some fears along the way. That turkey vulture was seeking a corpse to consume. We, however, were alive and better for our experience because we had survived the Balcony House Tour. 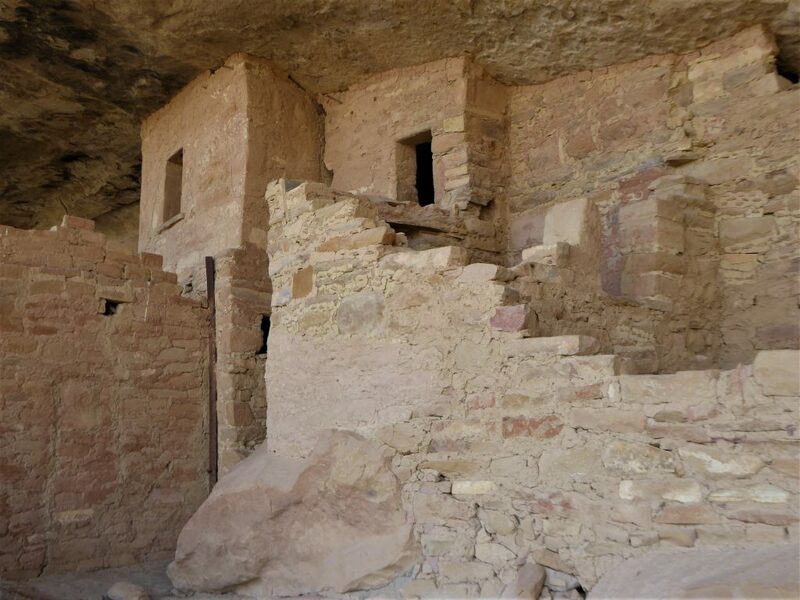 Our Tour of the Mesa Top Loop, Cliff Dwellings Loop and Spruce Tree House at Mesa Verde. Misadventures at Colorado’s Great Sand Dunes National Park. Our visit to the Ancestral Pueblo site Bandelier National Monument in New Mexico. Could you do it? 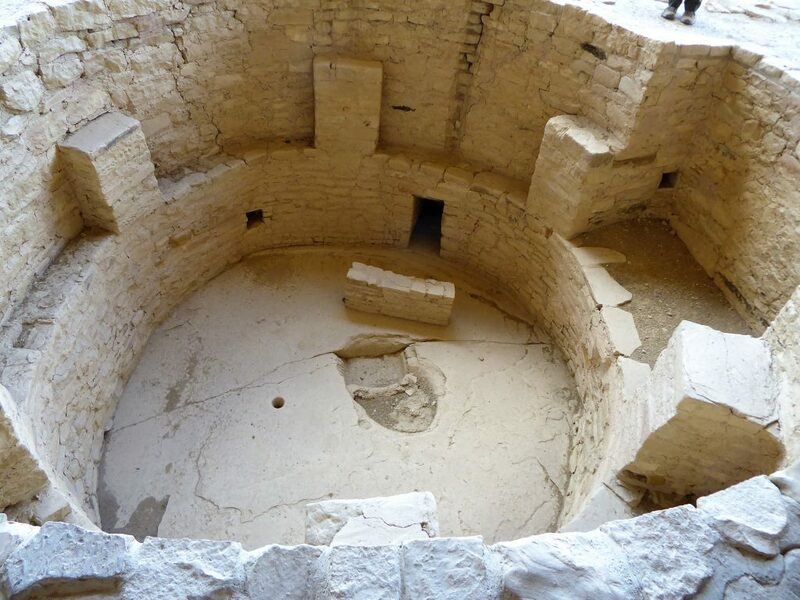 Or have you taken the Balcony House Tour at Mesa Verde? Let us know. Leave a comment below. Well, here’s another beautiful US National Park I’ve never heard about. I love the combination of beautiful (majestic really) landscape and archaeological sites- as a conservator, I used to work on archaeological sites as well, and this would be something completely new to me! Your kids are true adventurers, and you’re doing such a good thing raising them to be active and curious. Thank you. If you have worked at archaeological sites, you would really enjoy Mesa Verde. Love this! We didn’t take the tour when we visited Mesa Verde this summer, but now I feel like I DID take the tour. I love how up close you got with the area. Next time, I am going to book the tour for certain! We’re planning our return trip too. So much still left to do and see. Mesa Verde National Park as fascinated me for years. The amateur archaeologist in me would love the explore it and immerse myself in its history and mystery. Hope you get to visit some day soon. I’m absolutely fascinated by seeing older structures like this, that show us how people lived ages before us and yet were sometimes more advanced in their abilities (what they could do with far fewer tools/materials then we have now + some of the engineering they understood and executed without Master’s degrees!). However, this would be a difficult location for me to get to physically so I greatly appreciate getting to see it via your family’s visit! Yes, it is quite difficult to take this tour. 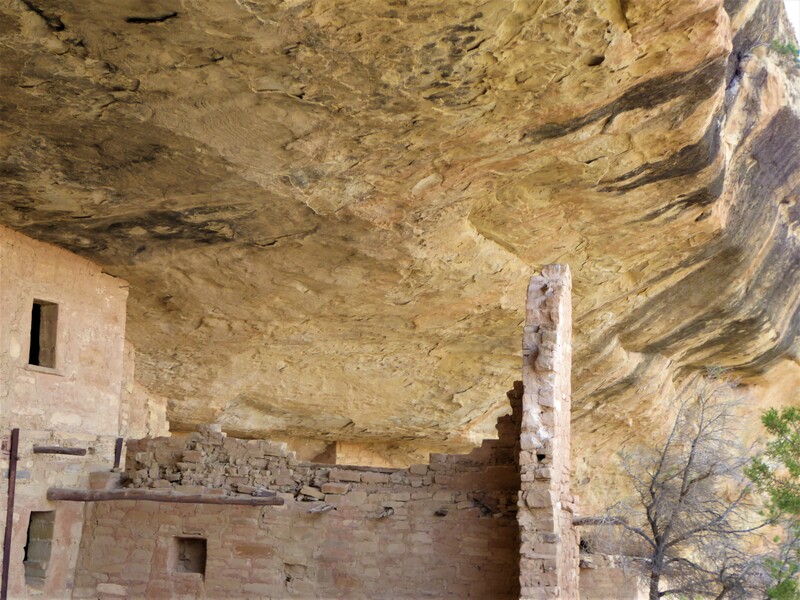 You can still visit and see the pit houses and cliff dwellings without the tours. These are much easier to reach. I’ve been dying to go here, it looks incredible and, from what my In-Laws have said, it’s an amazing experience! To be in a place where people lived so long ago and see exactly how they lived, how they used the land/resources around them, would be such an educational gift. Thanks so much for sharing this! I hope I get to go someday. We really hope you get to Mesa Verde soon. It is really amazing. Whoa! That is some staircase. I would have vertigo getting down, surely. What an unusual place the Balcony House it. We still use mortar and pestle in India sometimes, when we have to ground spices. It is quite a staircase. The trick is to not look down and keep moving. The tour definitely challenges your fears and allows you to conquer many of them. Those staircases winding up and the ladders make me break out in a sweat and I wasn’t even there! The views look like it was all worth it though. The views are incredible. They did make the journey worth it. It’s hard to wrap my mind about how ancient these places are. I would love to take this tour, and so would my kids! $5 is very affordable. $5 is a great price. It was interesting to think about the history of the people. They lived there for 700 years, and the U.S. has only been a country for 240 years. So there was a long history in this area that pre-dates the country. It was a great tour and a memorable adventure for our family. It’s on my bucket list to visit all of the national parks! You just put Mesa Verde up higher onto that list. I don’t think my whole family would be able to survive the house but I would love to do it! Mesa Verde is one of our favorite National Parks. Fascinating! Putting this in our National Parks list. Intriguing trip indeed. Passing through dark tunnel must have been heart stopping experience. And all the straight ascends and steep descends, quite an adventure. It was an epic adventure for our family. woah this looks like so much fun! 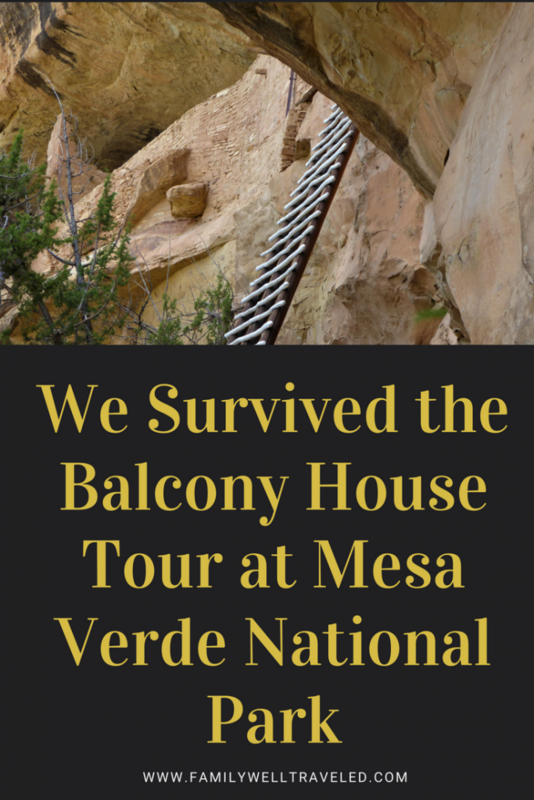 I had no idea that Mesa Verde had a balcony house tour! Such beautiful sights! Sounds like asuper interesting trip, will be putting it on my list of places to visit as i love anything historical. Although I’m not sure I’ll be any good on those ladders! WOW! What a cool experience, I have never heard of this before. Great photos as well. Some of those small openings and drop offs are scary!! I like the t-shirt idea from your son haha. You definitely have to know where you are walking at all times. Wow this is quite an adventue but cleary not for the faint-hearted. climbing up the steps and crawling through the tunnel? This is a tale you will live to tell. Yes, it was very memorable. Unforgettable for sure. Yes, summer is a good time to visit, although it is more crowded. The tours do not operate during winter months. What an amazing tour! You’re right. It doesn’t look like it’s for the faint of heart but looks amazing. So glad you guys got to go back and book a ranger led tour. Balcony House looks truly lovely. Absolutely stunning sights. The view of Mesa valley from balcony house is truly magnificent. You surely had an adventurous experience. Loved it. 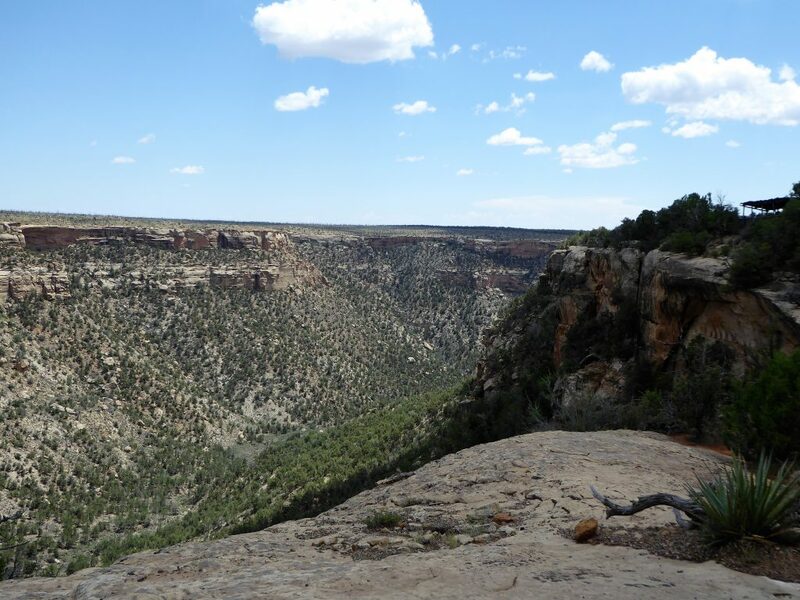 The views throughout Mesa Verde are truly special. This sounds like quite the experience and not for the faint at heart! I love to hear about travel stories like this, and it reminds me to some other places we’ve visited (like the Cerro Rico mines in Bolivia) where you really have to get out of your comfort zone to experience it. A great read, thanks for sharing! I enjoy traveling because it does offer us some opportunities to reach outside of our comfort zone. We are always better off for making the effort. The mines sound like a great adventure. Wow this house tour sounds insane! I don’t think I’d cope with climbing that ladder, never mind squeezing through those tiny corridors. What a great place steeped in history though. You definitely deserve a “I survived” t shirt after this. I told my son to simply keeping climb up the ladder and not to look back. He was up in no time. Oh my god, The Balcony House Tour sounds difficult but definitely worth the effort. I’m a history buff and love exploring these old, abandoned places, this one is topping my bucket list. Great post! Wow !! The pics look amazing.Looks like a fun adventurous trip.We love exploring such incredible archeological sites.Thanks for sharing.I have pinned it .